Local IT Review 2019: Is Local IT a Good Hosting? Local IT is a web hosting vendor that was originally started as a web design and development company. Based in Dhaka, Bangladesh, the hosting provider offers an array of internet services including, shared web hosting, domain name registration, VPS, VPN services, domain reseller, and email server. Local IT is a Bangladesh hosting company that markets itself as a cheap hosting company offering quality hosting solutions backed by 24/7 customer support. The vendor offers among other services: shared web hosting, web design and development, email servers, domain name registration, VPS, VPN services, and reseller hosting. Local IT has six data centers located in several countries across the globe including the United States, the United Kingdom, the Netherlands, Singapore, and Germany. The data centers provide the backbone on which the vendor offers its hosting solutions targeting both local and international businesses. Local IT servers are housed in highly secured data centers located in several countries across the globe. The data centers are in the U.S, the U.K., the Netherlands, Singapore, and Germany. 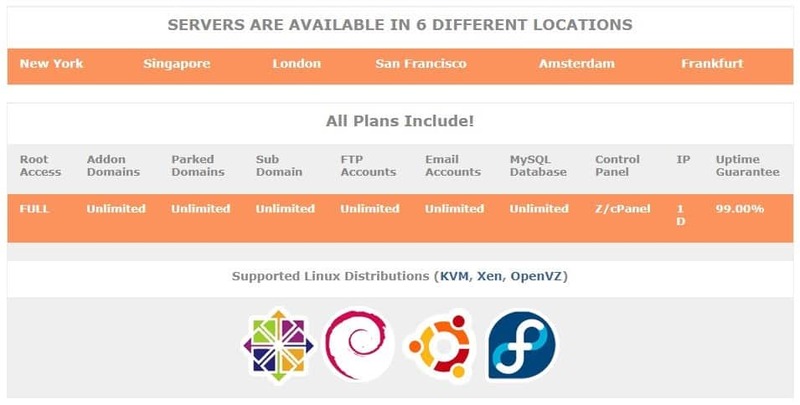 Its servers use the Linux distributions of OpenVZ, KVM, and Xen technologies. This combination of virtual server platforms allows a wide range of operating systems including Linux, BSD, Solaris, Windows, Haiku, ReactOS, Plan 9, and AROS Research. One of the notable hosting packages that Local IT offers is the Green web hosting. This package uses wind power, thus helping keep the world green and beautiful. Additionally, as part of its efforts in keeping the environment green, the vendor plants a tree for every new client it signs up. Local IT does not provide any backup solutions for its clients’ websites. Therefore, customers in need of data backups would have to outsource these services. All of Local IT’s hosting packages use free zPanel control panel. However, the vendor also offers cPanel control panel at a monthly fee. This can be quite off-putting to potential clients, considering that other hosting providers typically offer cPanel for free. For businesses in need of extra email services, you can subscribe to Local IT’s email server hosting package. The email hosting server offers high reliability, privacy, and security since it is hosted in an outsourced email system. Local IT shared hosting packages are quite cheap. That said, it is important to note that the vendor does not list the prices of all its solutions. For some like VPS and dedicated servers, users have to submit a pricing request to the sales team. The prices of the shared hosting plans are listed in Bangladeshi taka and U.S. dollars. What’s more, the hosting packages come in flexible monthly and annual billing cycles. Although this vendor’s shared web hosting solutions come with a 30-day money-back guarantee, its VPS and dedicated plans include no refund policy. That said, the vendor offers its shared hosting solutions with an uptime guarantee of 95% and its VPS and dedicated servers with an uptime network availability of 99.99%. You can contact Local IT’s technical support team via telephone, email, ticketing system, or by sending them a message through the contact form on the website. The hosting provider does not have live chat support. 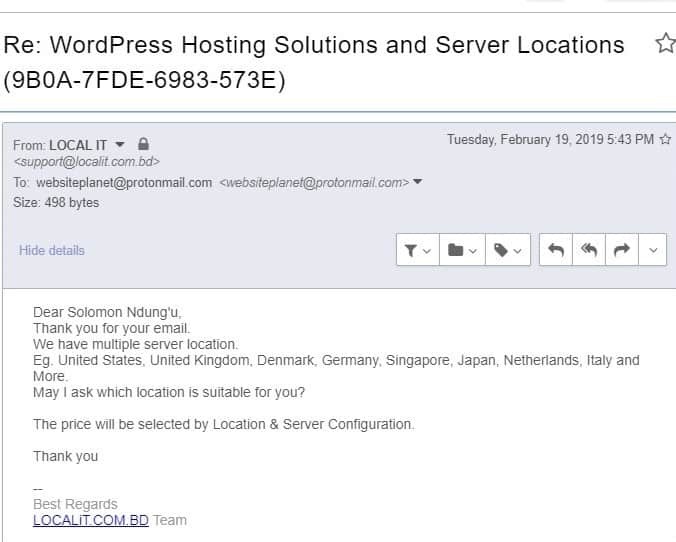 The customer support team is available 24/7 but are quite slow in responding to customer queries; it took them five days to respond to a query I had submitted about WordPress hosting solutions and data center locations. While the vendor has included links to its tutorials or knowledge base section, clicking on these links leads to a largely blank page with an image of what appears to be a credit card. Local IT seems to have invested substantially in its hosting solutions, allowing it to offer hosting solutions to businesses of all sizes. With data centers located across the United States, Europe, and Asia, this hosting firm has the capacity host websites not just in Bangladesh, but in practically any country the world over. All the same, one of the vendor’s greatest undoings is the fact that it does not offer backup services, forcing its customers to outsource backup solutions. Its slow-to-respond support team may also discourage would-be customers from commiting. Purchase green web hosting at Local IT! Wondering how Local IT stacks up against other Web Hosting companies? Enter any other Web Hosting company and we will give you a side-by-side comparison.